The DHC-1 Chipmunk was designed by Wsiewolod Jan Jakimiuk, former chief designer with PZL Warsaw, and now designer with DHC, as the successor to the classic DH82 Tiger Moth. The Chipmunk was the first primary trainer manufactured by de Havilland Canada, of Downsview (North York) Ontario. The prototype first flew on 22 May, 1946 under civil registration CF-D IO-X and the design proved most successful. The assembly-lines in Downview were to produce two hundred and seventeen units of this plane, the last one in 1951. The first Chipmunk in Great Britain flew in August 1949 and deliveries to Oxford University Air Squadron began in February, 1950. Eventually a total of 1283 were built, 1000 in England, 217 in Canada, and 66 under licence in Portugal to serve within the Portuguese Air Force following an agreement concluded between de Havilland and the Portuguese company, Oficinas Gerais de Material Aeronáutico (OGMA). The RAF was the largest user with 740 in service. These were flown by University Air Squadrons and Volunteer Reserve flying schools, and served as primary trainers for the RAF, Army Air Corps and the Royal Navy. The Belgian Air Force received two models for evaluation but eventually decided in favour of the SV4. It is a mechanically sound aeroplane and, consequently, some 500 Chipmunks are still operational around the world, having been supplied to Burma, Ceylon, Colombia, Chile, Denmark, Egypt, Ireland, Iraq, Jordan, Lebanon, Malaysia, Saudi Arabia, Syria, Thailand and in Uruguay. In the UK two are still operated by the Battle of Britain Memorial Flight and the Royal Navy, one with the Army Air Corps whilst in Portugal, seven are still in service with the Air Force Academy. 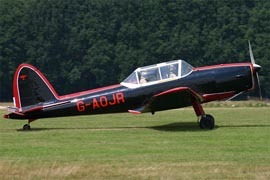 This example is a DHC 1 Chipmunk 22 - C1/0205.